Random And Some: "Everyone is responsible for marketing"
I just finished reading The Conversation Company (2012) by marketing savant Steven Van Belleghem. The book's predecessor, The Conversation Manager, had pleasantly surprised me last year, offering some great ideas and cases, and so when I stumbled upon its "sequel" in the Queromedia library, it only seemed right to check it out. Especially since Van Belleghem's spirited keynote about heartketing at the Google Partners event in March showed that he is indeed very passionate about leveraging online and social media to engage customers. In The Conversation Company, Van Belleghem outlines very clearly how organizations can maximize their conversation potential and unlock a tidal wave of positive interactions. His approach is predicated upon four pillars: collaboration, content, conversation and customer experience. 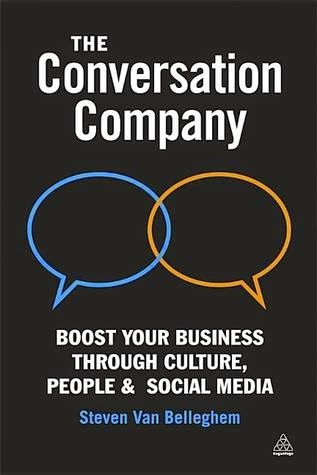 Becoming a #conversationcompany, however, is not an easy thing to do, particularly because the current outdated marketing model isn't up to the task. Fortunately, Van Belleghem offers a clear 3-step, 10-project blueprint to make the necessary changes. In true StevenVBE fashion, the book is littered with useful cases that demonstrate successful instances in which companies used conversational techniques to create content value. The philosophy Van Belleghem puts forth is a necessary one, and I loved the "Twitter is a pub" analogy, but overall I found it a bit bothersome how thin on new ideas The Conversation Company actually ended up being. It was still a worthwhile read (annoying Dunglish aside), but if you are looking for something new, you probably won't find it in this book. *Just kidding. I love you guys.